He was a Baptist Minister who lead the civil rights movement from 1954-1968. In 1963, he helped organize the March on Washington where he delivered his “I had a dream…” speech. And in 1964, he won the Nobel Peace Prize for contesting race inequality and nonviolent resistance. He was a man with great honor and what a way to honor him by celebrating his life and purpose. The parade is going to take place on 1/19/19 from 10am-12pm. The parade will move along Tryon St. beginning at 9th Street and ending at Stonewall. There will be more 90 community organizers, marching bands, floats and dance performers. Click HERE for all the details. There are several opportunities to volunteer you time and give back to community. This will take place on 1/19/19 from 112pm-2pm. What a great way to spend time with the family! All of the opportunities are located at various local Schools around the Charlotte area. At each location, you can participate in things like create math/vocabulary flash cards, making encouragement cards for Love In Action project, make bookmarks, bookworm buddies & bookworm letters with Promising Pages project. Click HERE for the details. 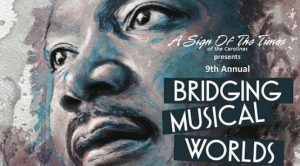 Concert: Bridging Musical Worlds a Celebration of MLK, Jr. This amazing concert is being held 1/20/19 at 5pm at the Friendship Missionary Baptist Conference Center. Tickets are just $5 in advance and $6.94 at the door. The concert features rich, diverse jazz and classical music. Click HERE for the details. All these activities would be way to bring families and communities to come together while celebrating a wonderful leader.